The Epoxy Putty we manufacture is applicable for different purposes like bonding, fixing, sealing and mending. Epoxy Putty is manufacture using superior quality of raw material procured from some of the most trusted vendors of the industry. 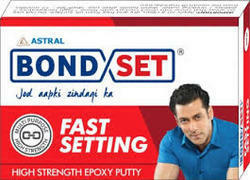 Facilitated by technically advanced process, we are presenting a distinguished collection of Bondset Fast Setting Putty. Available in variegated packaging options for our clients, this putty is used to remove dents on automobile surface. The offered putty is highly appreciated in the market owing to its features like accurate composition. Moreover, this putty is processed using supreme quality chemical compounds and advanced technology. 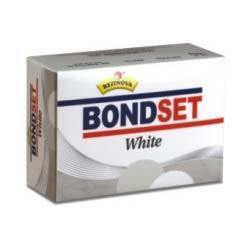 We take pleasure to introduce ourselves as one of the renowned trader, wholesaler and supplier of excellently Bondset White Putty. Procured from reliable vendors’ of the market, offered putty is highly acknowledged for filling joints between tiles and handicrafts. Moreover, this putty is checked against varied quality parameters before final dispatch at users’ end. Clients can avail this putty in variegated packaging options at nominal prices. 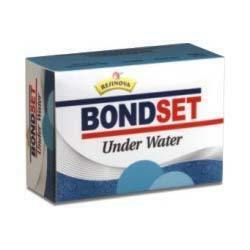 We are an eminent entity engaged in offering an extensive quality Bondset Underwater Putty. Our offered putty is highly acclaimed for its unique features, thus widely for joining tiles. The provided underwater putty is processed at vendors’ end using superior quality chemical compounds and modern technology. Apart from this, our valuable clients can avail this putty in variegated packaging as per their requirements at industry leading prices.